2016-01-31: Translation to German (by Armilus) was added. 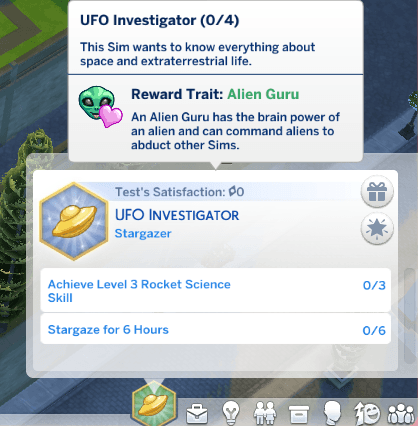 Back in the days of TS2, Knowledge Sims were obsessed with aliens and would constantly roll wants to be abducted. I really liked that, so I wanted to bring it back to The Sims 4 in the form of a new aspiration. 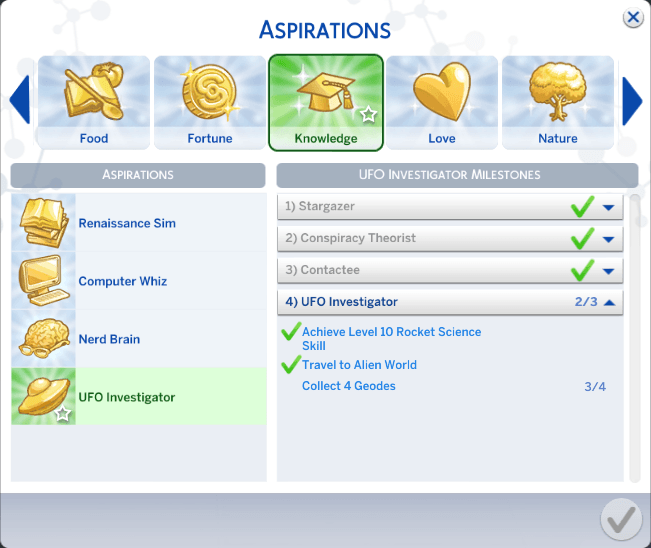 Let me introduce you to the custom UFO Investigator aspiration! This a knowledge aspiration focused on maxing the Rocket Science skill and visiting the Alien World of Sixam. Know the secret handshake of aliens. After thoroughly studying the lives of extraterrestrials, Alien Gurus have came up with a clever way to communicate with aliens. Yea, it's using their cell phone. Click on the Entertainment category in your Sim's phone to access this new interaction. Summon Aliens Pick a Sim and aliens will come to abduct them inmediately. 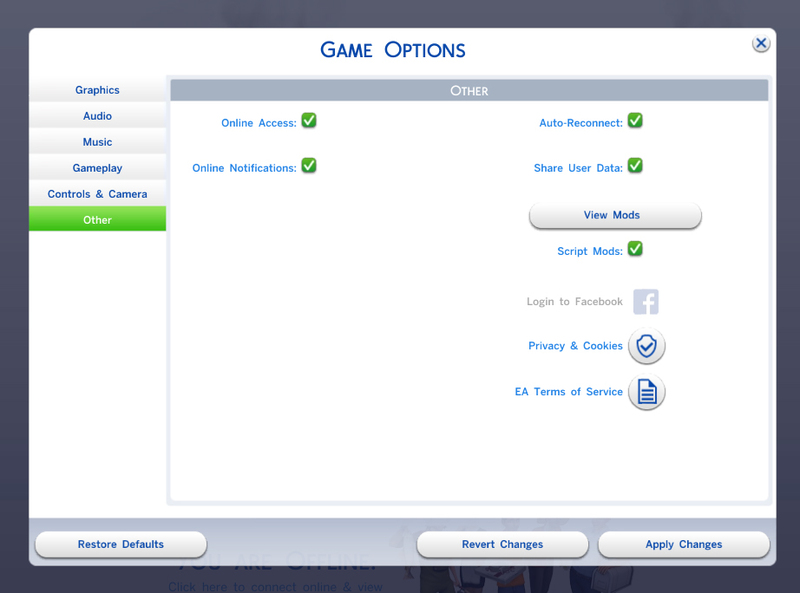 Only teens or older Sims can be picked. Aliens cannot be picked. The caller will get a slight Fun and Social boost. They will also build Mischief skill. Geeks, Goofballs and abductees with the Cheerful trait will gain relationship points with the caller (unless they're Hot-Headed or Squeamish). Other Sims will react negatively. Male abductees have a 50% of returning pregnant. Aliens and half-aliens can now prepare Alien Juice and Space Energy Drink. Squeamish Sims won't get Focused after alien abductions. Sims in the Astronaut career will always get Focused after returning from an abduction. Sims cannot unmask fake aliens (i.e., Sims who drank the Alien Aura Serum). Fake aliens can now revive dead alien collectibles and transmute metals. Unzip with 7-zip (do not use WinRAR) and place r3m_ufo_investigator.package and r3m_ufo_investigator.ts4script in your Mods folder. Make sure to enable Script Mods in the game options. This mod requires Get to Work. It was made with game version 1.13 (but I'm keen it is still compatible with later versions, let me know if there's a problem though). Q: New interactions do not show up! : Did you use WinRAR to unzip the mod? Please re-download and try unzipping with 7-zip and make sure to enable Script Mods in the game options. If the problem persists, post here and state your game version. This mod is currently available in English and German. Download the strings, rename the file to your language's code (e.g., SPA_ES, FRE_FR, DUT_NL) and send me the file once you're done editing it with Excel or a text editor. Armilus for their German translation.